I personally prefer to use Github repository issue to manage my knowledge. 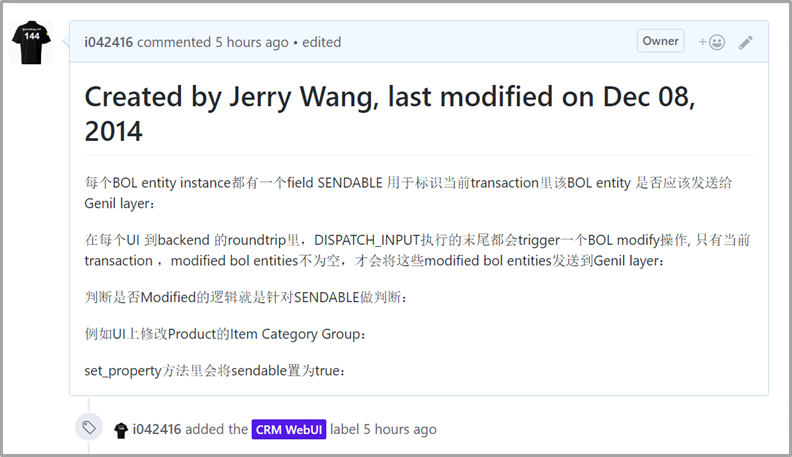 For issue, this is my github repository to store ABAP and SAP CRM related knowledge of mine and currently it has already 285 issues. As the accumulation of issue number, I have to consider the possibility of issue backup, so that I can still have access to my knowledge repository when the public github is not available ( for example due to network issue or access within China banned by government due to political reasons, who knows ). 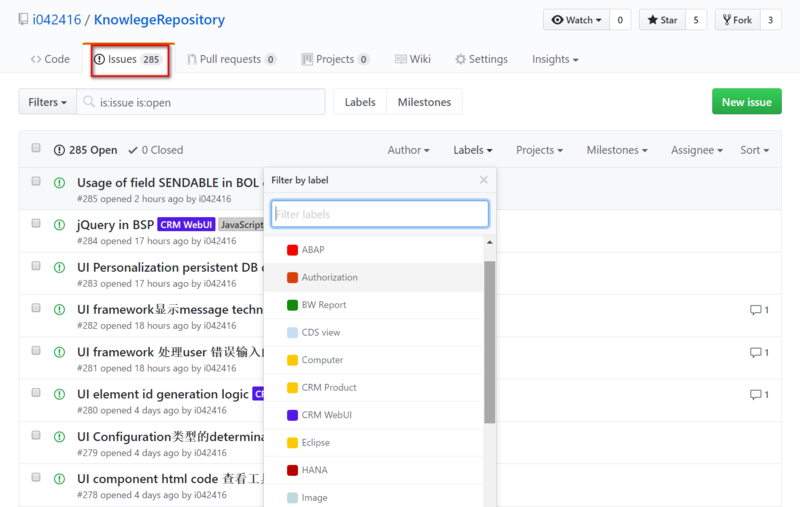 However after I go through them, I found none of the tool can 100% fulfill my backup requirement, as a result I plan to write one backup too on my own using github public API documented here. 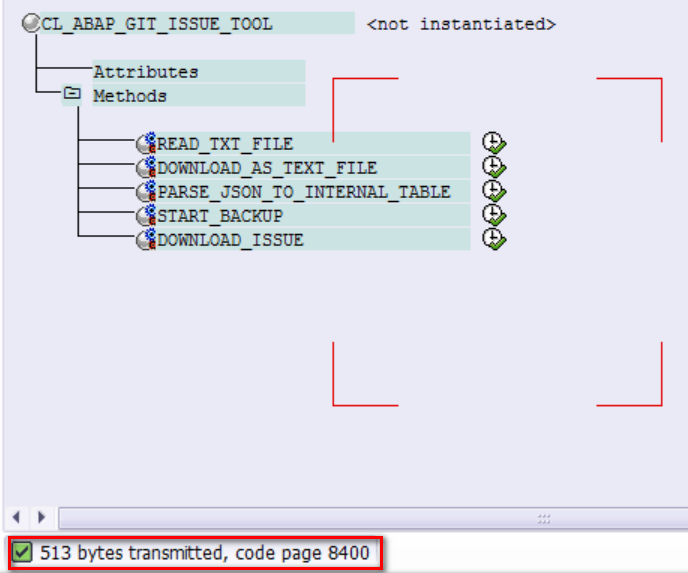 Since as an ABAPer we have powerful Netweaver behind us, I plan to develop a tool which can extract all issues of a given repository and stored them in an ABAP system, so that I can use all kinds of ABAP tools for example CDS view to make analysis on those issues later. Only a single API endpoint is used in this tool, see how to use it below. In my example above, the response is a JSON string which is an array with each element representing an issue detail. 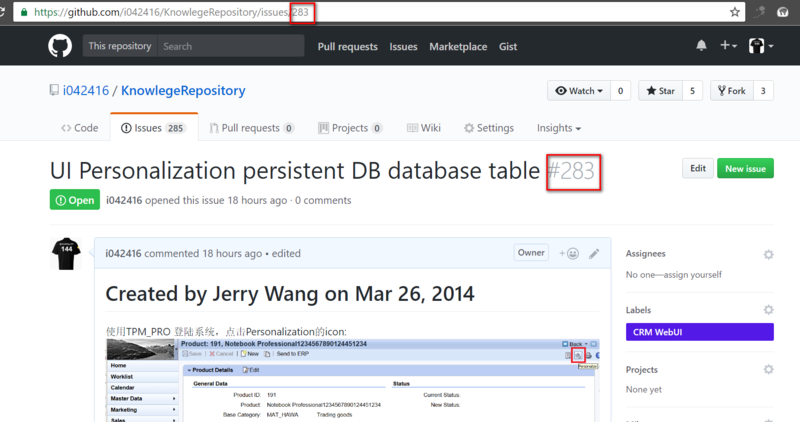 In github repository each issue is marked with a number, which could be easily found in issue url and issue detail page. The delta backup function means for example I have finished the backup of current 285 issues, and later when I create two new issues 286 and 287, and then I run the tool again, only 286 and 287 should now be exported and persisted into ABAP system. 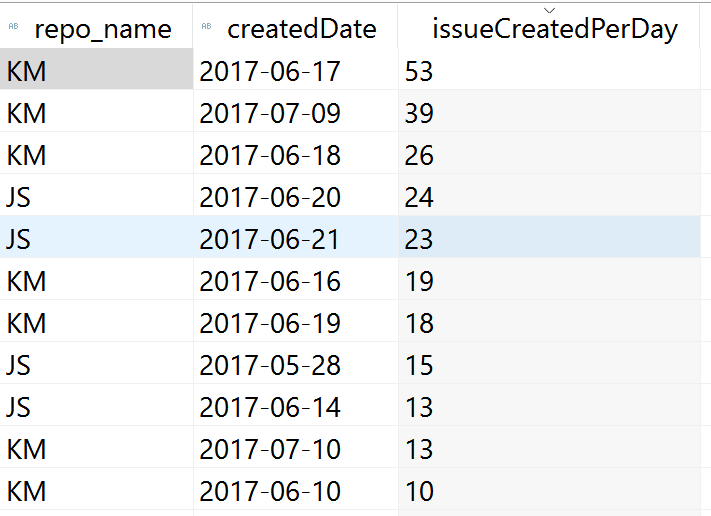 In current Github REST API V3, by default only 30 issues are returned in a single API call. If there are still left issues to be exported, there will be two indicators stored in HTTP response fields of this single API call, one (rel=”next”) contains url which returns the next 30 issues and the other(rel=”last”) contains the url which returns the issues in the last page ). This paging logic should also be supported in the tool. For more detail about API rate limiting topic, refer to Github API documentation here. And fill one entry for the github repository whose issue you would like to extract accordingly. You can choose any name in column REPO_NAME which acts as an internal key for the github repository name. 2. execute method START_BACKUP of tool class, specify the internal repository name you specified in the first step. 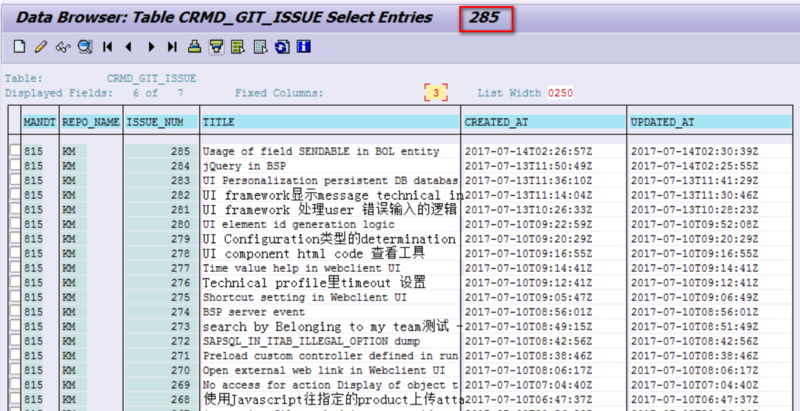 Once finished, you could find that all issues are stored into table CRMD_GIT_ISSUE. 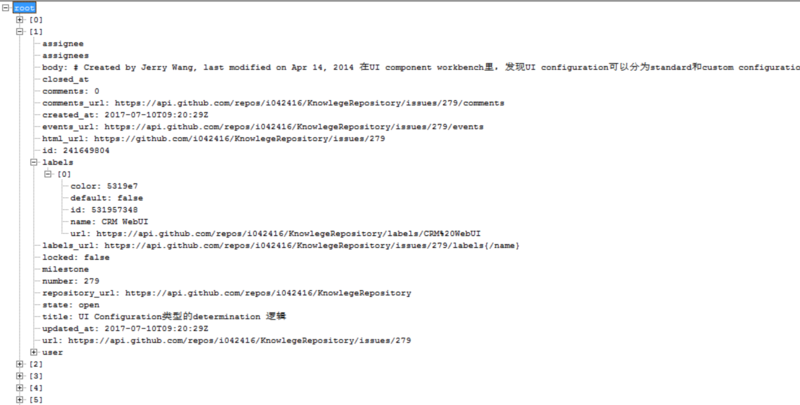 Since most of my github issue contains Chinese characters, so I use code page 8400 in the code. Multiple labels could be maintained for a single issue and it is very convenient to search by these maintained labels. Currently the label information is not stored in the database table. Solution could be found from CDS view CRMV_GIT_ISSUE. Solution could be found from CDS view CRMV_ISSUE_CREATION_DATE_COUNT. Solution could be found from CDS view CRMV_GIT_ISSUE_IMAGE_NUM. Currently only the issue source code with markdown format is extracted and stored in database table in ABAP server. 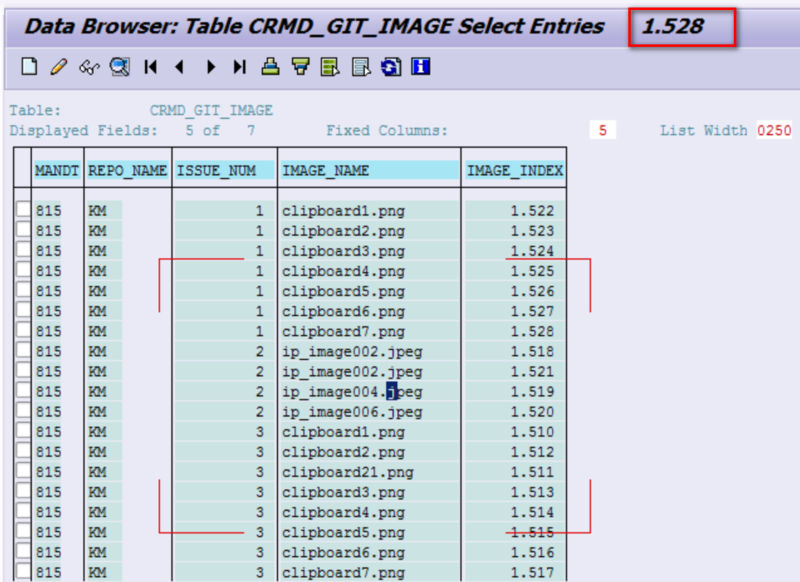 However most of my issues contains screenshot and in the issue source code only a reference to these image files are there – the binary content of image files themselves are not stored in ABAP server. This could be enhanced in the future. Image binary data backup has also been implemented. Create a new transparent table below to store the image binary data. Once finished, all the pictures used in the issues of repository KM will be stored in that table. The source code of the tool could be found from my github.